The word our customers use when they see their finished deck made from our supply of Garapa wood decking is "Golden." Golden looks. Golden durability. Golden value. When you compare Garapa to other types of decking, you'll see it is just as strong as teak, with a richer, more vibrant display of golden to honey browns. Also, with natural termite and decay resistance, Garapa wood is a reliable decking option you can install and enjoy for decades. So, given how durable and lusturous Garapa is, buying this material must be expensive, right? Wrong. Garapa prices are extremely affordable given its resilience, and gorgeous looks. Also, to make installing this gorgeous hardwood easier, we offer several step-by-step how-to guides. Like buying precious metals, building an exotic hardwood deck made of Garapa is a sound investment. 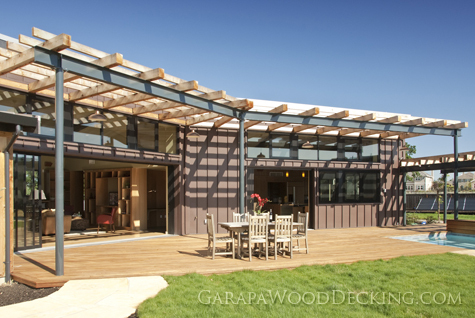 Boost your home's value and your outdoor living experience today with Garapa wood decking. Contact us for a free quote and to buy Garapa decking.